Vladimir Putin has taken a ride to the depths of the Black Sea as part of a Russian Geographical society expedition. The Russian leader saw the remains of an ancient vessel, and spotted quite a few centuries-old relics, he told journalists. A three-seat submersible plunged Putin down 83 meters (272 feet) on an exotic underwater trip off the Crimean shore. During the 45-minute dive, the Russian president was able to have a glimpse of a recently discovered sunken ancient Byzantine galley, dating back to the 9th or 10th century. In his post-dive press-conference Putin also mentioned that he could likely venture to the same depth alone in a diving suit, TASS reported. However, he added that the task would better be left for expert divers to perform. Putin also congratulated the Russian Geographical Society on its 170th anniversary – right from the sea depths. The Russian Geographical society was founded in 1845 by Emperor Nicholas I to explore the vast territories of the country. Nowadays, it is a non-commercial organization that is engaged in expeditions, research, education, nature conservation and book publishing. The trip has been “a good reason to make sure once again how deep our historical roots lie, how deep our history of relations with the whole world is,” the president said. 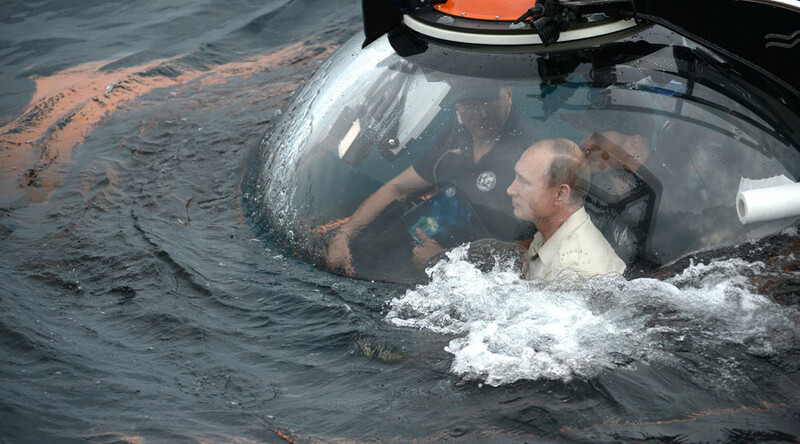 Putin is not new to underwater expeditions. In July 2013, the Russian President made a half-hour trip in a small submersible craft to examine the remains of the naval frigate Oleg, which sank in the Gulf of Finland in 1869. Back in 2011, after scuba-diving in the in the Taman gulf of the Black Sea, Putin returned with two ancient Greek urns in his hands. In 2009, Putin plunged in a sub to the bottom of Lake Baikal, the oldest and deepest in the world. He called the lake’s waters – which constitute 20 percent of the world’s fresh water reserve – a “plankton soup”.